or will a deaf window offer her a perch to sing? It is time to say goodbye to Zaha Hadid. Zaha Hadid was an Iraqi-British architect who received the British Royal Gold Medal of architecture in 2016 in recognition of her substantial contribution to international architecture. And indeed, her work is distinctively stunning! Recognizable at first sight, characterized by curving forms, fragmented geometry and multiple perspective points. Her architecture is a vibrant hymn to the changing times we’re passing through. In 1979 she established her practice in London and fair is to say she was an exception in a very masculine and old-fashioned line of business. But no matter how different she was, she quickly gained greater distinction due to her mathematical skills and professional stamina. Her algorithm driven avant-garde work became a style of its own called parametricism. She reached fame in 1993 with her work on the Vitra Fire Station in Germany. As years went by, her buildings became more and more curvaceous, abstract and futuristic. Some say she got some inspiration in her cultural background, specifically in the Arabic calligraphy. Her freedom of expression reminds me of Antoni Gaudí’s great work. Although significantly different, their stunning styles are as innovative as progressive, leaping away from conformity with genius and passion. 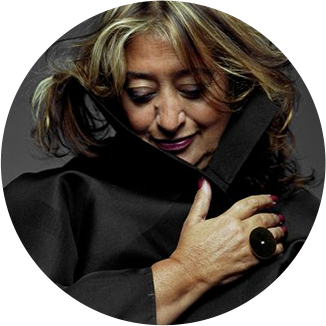 Zaha Hadid was also a brilliant designer, rethinking furniture and usual objects with her talent and unique signature. She also created jewelry: witness the amazing structure of the bracelet displayed here below.